Zola returns to Chelsea as assistant manager…. Former Chelsea and Italy striker Gianfranco Zola has returned to Stamford Bridge as assistant to new manager Maurizio Sarri. As a player, Zola helped the club win two FA Cups, one Uefa Cup Winners’ Cup, one Uefa Super Cup and one League Cup between 1996-2003. “For me it is an amazing thing. I am pleased to be here,” said Zola. 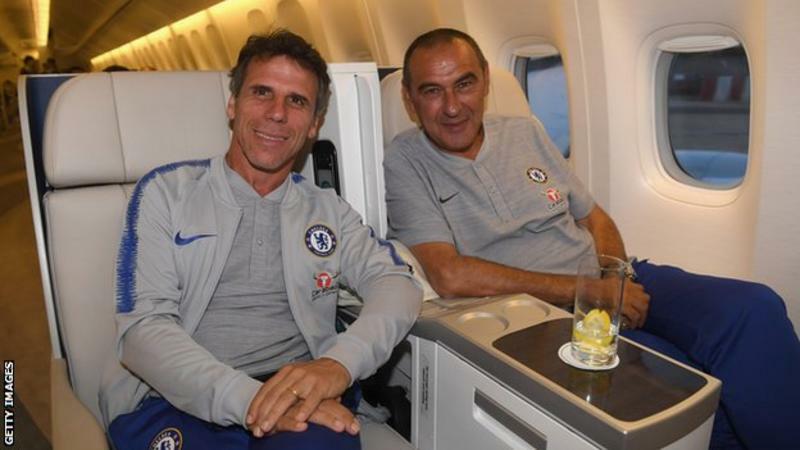 Zola, who resigned as Birmingham City manager in April 2017, has joined Chelsea’s pre-season tour of Australia. Fellow Italian Sarri, 59, was appointed Blues boss last week after fellow compatriot Antonio Conte was sacked despite winning the Premier League title in 2016-17 and FA Cup in 2017-18. “It would be great to be successful with Maurizio and for the club and I will give my best, as I did in the past as a player,” added Zola, 52. “I am very much looking forward to the challenge in general. I would love us to start well and we are all very excited to start this new adventure.” Zola made 312 league and cup appearances for Chelsea, scoring 80 times. He has managed West Ham United, Watford and Italian side Cagliari. Zola signed a two-and-a-half-year contract with Birmingham in December 2016 but quit four months later after a poor run of form. ← Liverpool agree fee for Brazil goalkeeper….